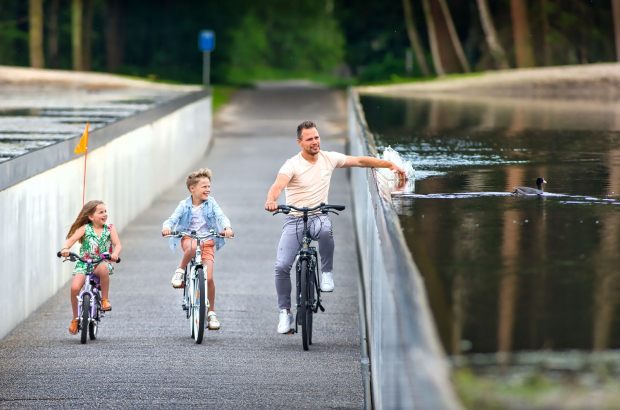 Cycling Through Water, Limburg’s sunken cycle bridge, has made Time magazine’s Greatest Places list for 2018. The annual list includes unique and awe-inspiring sites around the world. Cycling Through Water is a bridge across one of the lakes dotting the Wijers region of Limburg. It is near cycle junction 19, close to Bokrijk open-air museum in Genk. The bridge is sunken, putting cyclists at eye level with the surface of the lake. “Walking on water may elude most of us, but this bike trail in northern Belgium offers an experience that’s almost as divine,” writes Time. "We do not want to create more miles, we want to create better miles," a spokesperson for Toerisme Limburg told the magazine. The bridge, opened two years ago, is the first in a number of innovative cycling experiences planned for the province, which bills itself as “cycle paradise”. Eventually, there will be a raised path that puts cyclists among treetops, as well as a path that goes underground. Cycling Through Water is in good company on the list, which also includes the amazing Golden Bridge in Ba Na Hills, Vietnam, the Underwater Museum of Art in Florida – which must be visited in diving gear – and the Temple of Mithras in London.